Most existing spa heating designs have their roots in the last millennium. Even though spa heat exchangers have been used for over 40 years they are still light years ahead of current spa heating technology. The InDekSolar© heat exchanger is an uncomplicated high quality heating system that doesn't require the maintenance of a pool heater. Heating performance for a standard 40 gallon gas water heater is capable of replacing a standard gas pool heater, while taking up less of a footprint, inside the pool equipment room. The cuprinol spa heat exchanger drawing illustrates the simplicity of the heating system. The heat exchanger hot water pipes connect to the gas or electric heated water storage tank in the home. 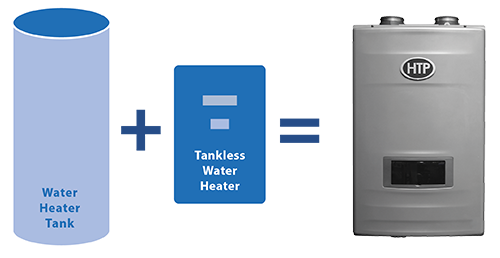 An in-home DHW solar and a hybrid tankless water heater can also work in unison to heat the spa. A tiny hot water circulator pump connects to a stand-alone electronic thermostat controller or an existing swimming pool controller. Optional smart phone thermostat control is available. Tremendous operating cost savings and equipment longevity are the key benefits. The heat exchanger eliminates the gas spa heater and installation cost. The spa heat exchanger will outlast the gas heater by 3 times as many years. A solar water heater pre-heats the electric or gas water heater storage tank. The solar water heater, when hooked up to the spa heat exchanger, doubles as an in-home DHW water heater, as well as a spa heater. The tiny 230 volt 1/12th horsepower DHW heat exchanger circulator pump uses very little energy. in some cases it can cost as little as $30.00 electricity per year and is whisper quiet. The internal wetted metallic parts are constructed with stainless steel for longevity.